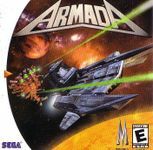 Armada is a top down arcade space shooter with a strategy/RPG metagame providing depth to the gameplay. Increase your ship's capabilities/strengths by earning XP through destroying ever tougher aliens, completing missions etc. Upto 4 players can battle it out in local multiplayer. A sequel was in development for the Dreamcast but never released.